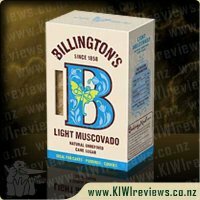 Live on the wild side a little, with this unique combination of two Kiwi classic flavours - Sour Cream & Onion + popcorn. Comes sealed in a resealable 70g tub. Corn, sugar, salt, vegetable oil, sour cream & onion seasoning. As many other reviewers before me, I was a little bit dubious about a savoury flavoured popcorn. Popcorn is generally a sweet food - covered in icing sugar, caramel or candy and certainly eaten as a treat. Once I thought a little further though, much of the popcorn you buy at the movie theatres is butter and salt flavoured, so it does have a savoury twist. I can say for sure though, I have never come across sour cream and onion flavoured popcorn but I was interested in giving it a try as it is one of my favourite potato chip flavours. I absolutely love the mushroom shaped popcorn. I don&apos;t eat a lot of popcorn and that&apos;s simply because I hate the way it sticks in your teeth, and often end up coughing with small pieces having gone down the wrong way. This mushroom popcorn certainly doesn&apos;t do the same, although it did catch in the back of my throat slightly twice, but never enough to make me cough. The little bumps and ridges seem to be big enough to hold onto the flavour too. The flavour is, well, pretty damn good! The fact that I&apos;ve made my way through half of the container just while writing the review up to now says that. It is very moreish - you have a piece or two and try to hold off, but the flavour is just so good you have to go back for more! The flavour is very strong, however if you had given me a piece with not knowing what it is, I&apos;m not sure I would have guessed sour cream and onion. There is still quite a sweet taste to it, and seeing that there is 26g of sugar in the one serving I am not surprised. Sugar is also the second listed ingredient, then followed by salt - which is the other strong flavour I can taste. There is a slight after taste of sour cream and onion but that flavour certainly isn&apos;t prominent. The serving size of this popcorn is 70g, which is the entire container. I managed to stop myself half way through only because I wanted to save some for another time, I didn&apos;t want to eat it all at once. However, if I was sitting down to watch a movie or relax in front of the television, this serving size certainly wouldn&apos;t be enough. Also, with the price, it is too high to be something we would purchase often. Being only one serving in the container I would have to buy two for hubby and I to have a serving each, and that would be almost $9 worth just on popcorn. So while we might have it once in a blue moon as a treat, unfortunately the price would stop us for purchasing it regularly. After reading some positive reviews about this popcorn and also in particular this flavour I decided it was well worth a gamble of trying. 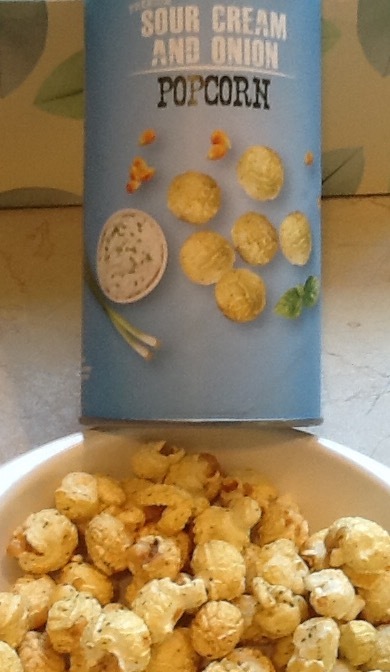 Boy oh boy am I so glad that I did ~ our whole family has utterly loved this sour cream and onion popcorn! This totally took me by surprise because quite simply if someone had of asked, I would never of thought that I would like the flavour. My husband had similar thoughts while my 2year and 4year olds gobbled the popcorn up with no room for words due to the cramming of said popcorn into their little mouths! I had never heard of the &apos;mushroom&apos; variety of popcorn that Eureka popcorn uses but their description that the &apos;popcorn forms large, roughly spherical balls of tastiness&apos; is truly 100% correct. In comparison to this is the &apos;normal "butterfly" popcorn which pops out into a wildly-shaped mess, with bits of husk that get stuck between your teeth&apos;. Such a difference that I knew nothing about until this product. Well Eureka you&apos;ve totally done it here. You see I used to really love butterfly popcorn, you know the sort that&apos;s covered in butter. Except now that I&apos;ve tried the pure deliciousness that is Eureka popcorn and also the mushroom variety - I am totally converted!! I hate to mark down such a fantastic product but I did for serving size this time round, quite simply because it needs to be bigger!! And I say NEED as it really is a must haha. I just scrapped enough of this serving together so that my husband, myself and our children aged two and four could try this. I also used some in a little experiment, making a twist on my daughters favourite meal popcorn chicken (which is normally just chicken breast cut up and crumbed, named popcorn chicken after the fast food variety). This time round I did the same but added crushed sour cream and onion Eureka popcorn into the mix. My four year old thought this was the best dinner she&apos;d ever had, she couldn&apos;t believe I&apos;d used and cooked popcorn for her dinner! 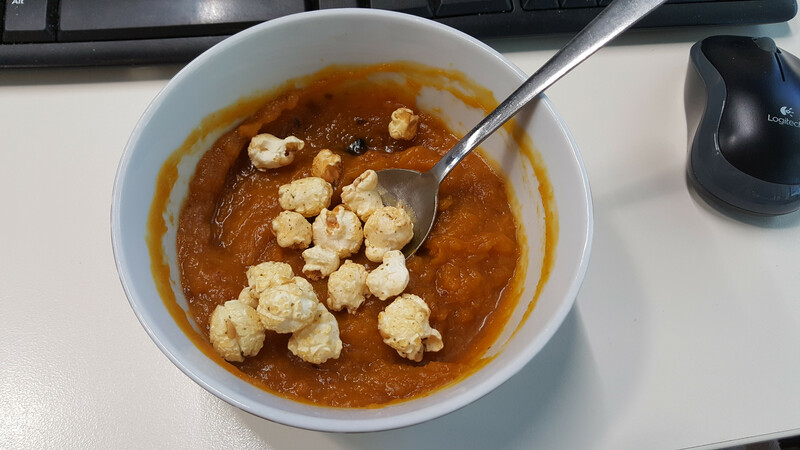 She then declared "wow mum, my dinner tastes like popcorn for real&apos; - I think its fair to say that the flavours still rung through strongly! The taste is divine, you get no little bits stuck in your teeth and its quite refreshing that it isn&apos;t butter flavour (as much as I do love butter popcorn). 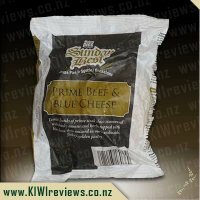 I really can&apos;t rate this product highly enough and I will be purchasing again - a slightly higher price tag but the quality and taste is worth it. I highly recommend you try this today! I will say outright, that I don&apos;t think this range of products is for me. I&apos;m not a huge fan of sweet popcorn; especially not in the levels found in this product. Sugar makes up 38% of the weight. But as it was my mistake to not properly read through the ingredients before requesting this product to review, and I will attempt to remain unbiased towards that aspect in the remainder of my review. My final thought on the sugar aspect is that I would really expect a product like this to mention somewhere on the front that it is a sweet popcorn. When it only says Premium sour cream and onion popcorn, I kind of expect a savoury flavour. The product comes in a packet that looks like a shortened Pringles can, and I love the idea because my fingers will often get messy trying to grab the popcorn, or if my hand rubs against the side of the packet I end up covered in butter. With this package, I can easily grab the top pieces, and then just tip the rest straight into my mouth. Just like the Pringles can, it is too slim to be able to fit my hand in at all, but it&apos;s very easy to tip and shuffle the kernels to within pinching distance. This mushroom variety of popcorn is a bit different to the usual butterfly popcorn, and it holds its shape together very well. It doesn&apos;t have the offshoots and pieces that snack off every time you try and grab them. It remains intact and has a roughly spherical shape that makes them easy to grab. I don&apos;t know whether "mushroom" is the scientific name for the product, but I would certainly seem them as more cauliflower in shape; densely packed popcorn pieces. 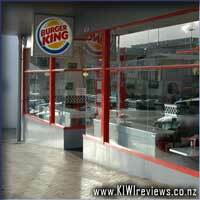 The flavour is generally what the name implies. When you first bite into them, you get that sour burst of sour cream, before the onion flavour kicks in and lingers on the breath. The strength of the flavour is surprising. It is definitely one of the strongest popcorn flavours I have come across, and I imagine it will be polarising as to whether you love or hate them. It could easily come across as overpowering. The sugar is helpful in this regard as the sweetness does temper the sour cream slightly. But overall it isn&apos;t something that I enjoyed. Perhaps is it was a bacon and sour cream flavour; something that was fully savoury, and had a non-sweet flavour to temper the sourness. When you hear the word &apos;popcorn&apos; you automatically think of buttery, sweet, slightly salty popcorn which you classically get at the cinema or out of a bag from the supermarket. 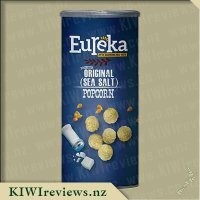 That is why I was really keen to try this Eureka Premium Popcorn in sour cream and onion flavour. When you think about it, it makes sense to have a savoury flavour with popcorn- I mean you&apos;d never question putting cheese or jalapeno flavours with a pack of corn nachos right? But in my (obviously) highly sheltered life, I had never considered savoury popcorn. After this Inception-like realisation, I was really excited to receive a tube to trial. First of all, the packaging. The cardboard tube is a genius idea. How often do you get popcorn in a bag and at least a quarter of it is crushed? This sturdy tube keeps the contents safe and well protected. It also allows for better storage once opened (although that also means that you don&apos;t have the excuse of having to eat it in one sitting!). I was also really impressed with how much was packed into the tube. It appears to be like a tardis - from the outside, the packet seems pretty small, but the popcorn within it seemed to keep going and going! The shape of the popcorn was slightly unusual compared to what I&apos;m used to. It was nearly perfectly spherical, which is down to the &apos;mushroom&apos; type of corn which they use to make it. It gave a much more even spread of flavour, meaning that there were no &apos;dry bits&apos; like you can get with your traditional packet. I was also really happy to note that there was almost no husk or gritty bits like you usually get with popcorn. The &apos;bits in our teeth&apos; feeling is one of the main reasons why I don&apos;t eat popcorn more, so it was such a relief not to have to worry about this. Now for the important bit- how did the savoury flavour work? One word- delicious! It had just the right balance between the slightly tangy onion and softer and slightly sweet sour cream. It is such a classic combination, and worked so well with the corn, I had to question why no-one had thought of it before. Another really useful aspect of this popcorn is its use outside of a simple snack. I tried crushing it and adding it instead of breadcrumbs on top of a pasta bake which left a lovely crunchy and slightly chewy topping. 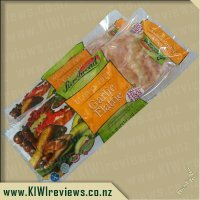 I also used it in place of croutons or bread to have with my pumpkin soup- a match made in Kiwi heaven! Overall, this popcorn is great. Much more than a different form of popcorn, it&apos;s moreish savoury flavour means that it can be used for so many things, as long as you can stop yourself from snacking on it first of course. Without husks it&apos;s great for the whole family (or in my case, picky adults). The tube may appear to be on the higher end of the snack price spectrum, however when you consider the amount of popcorn present, it feels like you&apos;re getting great value. All in all a winning product and I really wonder why no-one thought of this before- I guess that&apos;s why they called it Eureka though, right? This is by far the yummiest popcorn I have ever eaten. I never thought sour cream and onion would be a flavour that would jump out to me but wow I am completely wrong. My son opened the popcorn and came running into my room saying how yum the popcorn was and he just wanted to eat the whole lot. I said he had to save me some for my review. 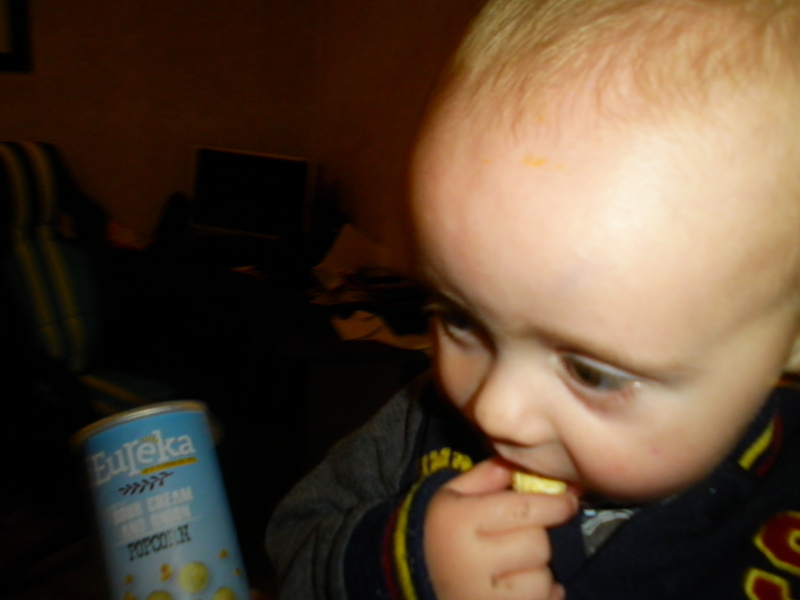 He loves popcorn and normally enjoys sweet and salty, but he was very much enjoying this flavour. My partner then tried a couple before dinner and he was the same, raving about how yum the popcorn was and how he wanted to finish the cartoon of popcorn. He said this was the yummiest flavour he had tried and wished he could eat a lot more of them. I was the same when I tried the sour cream and onion flavoured popcorn, wow super yummy and nothing else like I have tried before. I think this flavour and the size of the popcorn is perfect. It also has that butter taste to it as well I found even though no butter is added from reading the ingredients. The cartoon is colourful and funky and reminds me of pringles cartoons which I love. I love the pale blue cartoon and popcorn pictures, and picture matches exactly how the popcorn looks inside. The price I would say is a little too much for a snack and a one time snack at that. It is not a snack that would go far, and once you start you could not stop. Maybe if it was a dollar cheaper would probably be more suited for me but that is my opinion. Overall super yum and you would be satisfied with the flavour and texture, this was a winner by all three of us who tried the sour cream and onion popcorn. In our house sour cream and chives is the only flavour of potato chips that we all agree is delicious. My girls (7 and 9 years old) hate onion with a passion and refuse to eat a dish if they suspect there is onion in it. 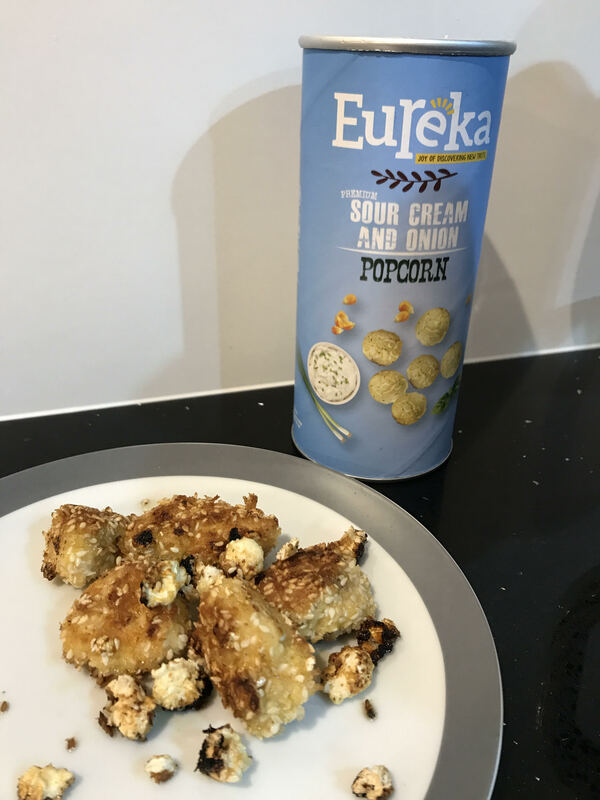 I wasn&apos;t sure what they would think of Eureka&apos;s sour cream and onion popcorn but I was pretty sure I would love it as would my husband. 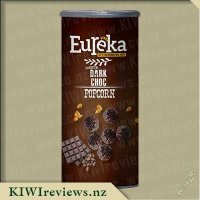 I had shared Eureka&apos;s dark choc popcorn with them the day before and they loved it. I showed them the sour cream and onion and even read out the flavour to them and they wanted to try it. I gave them a single popcorn ball to try, just in case they decided it wasn&apos;t for them and threw their share in the rubbish. They both loved it and got the bowls out so we could share the tube as we had done with the other popcorn. What a shame, I thought to myself, I can&apos;t enjoy the whole tube by myself. The popcorn, like the choc ones, where in a Pringles type tube and filled to the top so you certainly didn&apos;t feel disappointed when you peeled back the foil seal. They were a beautiful ball shape which would look great on a platter. This also mean there weren&apos;t those annoying popcorn husks or mess that we as parents associate with eating popcorn. The popcorn was surprisingly sweet for a savoury flavour. When I looked at the list of ingredients I realised that sugar was second on the list. I actually quite liked the take and it was like eating sour cream and chives chips but with a different texture. I was also pleased to see that there wasn&apos;t much flavour left at the bottom of the tube. 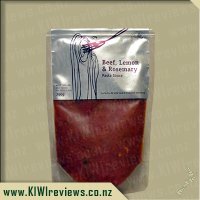 I am keen to buy these and try more of the flavours in the range. I am not sure if the children will let me get them without sharing with them. These would be great in a gift hamper. Yeah if someone had told me that sour cream and onion was going to work as a popcorn flavour I would have measured them up for a straightjacket. I mean really? But when I visited the reviews guy to pick up stuff, he convinced me to give it a try, telling me that I would be surprised. He was right. This really is an odd thing to think about, but when I tried some I was shocked at how good it tasted. 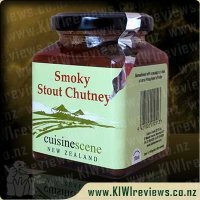 It&apos;s got a bit of sweetness to it, but it has a really nice savoury flavour too. It&apos;s like he said "sour cream and onion works on chips right? That&apos;s just starchy carbs, so is popcorn. We have just been raised to see popcorn as a sweet product. It&apos;s not. it&apos;s whatever we make it." 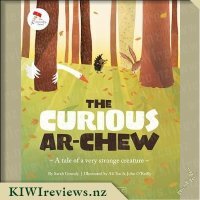 So I give nods to the guy at KIWIreviews for convincing me to take the risk, because I really liked this one. There&apos;s not really a lot to say, because it tasted good, it was easy to eat, there were no bits stuck in my teeth, and the best bit was that I got to have it all to myself because no-one else on site was brave enough to risk it. 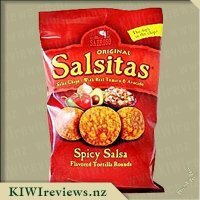 If you like sour cream and chives chips, there&apos;s a good chance you&apos;ll find this worth trying too. It has a good shelf life thanks to some little plastic chip in the tub that does something fancy, so be sure not to accidentally eat that. And of course the tub is resealable so if you can&apos;t eat it all at once, you can stash it away. Give it a go! I only wish it was a bit cheaper - popcorn is a massively overpriced food but it looks like these are imported so that&apos;s probably where the cost goes. I was lucky enough to try out 3 of the flavours in the Eureka popcorn range and I have to say that this Sour Cream and Onion variety was my absolute favourite. Growing up as a young child I remembered going to the Fieldays every year with my Dad, the highlight for me of this yearly event was when I got to go to the popcorn stand and sample all of the different flavours which they had, I always loved one which was sour cream and chives, I was saddened when the company no longer kept producing it. So to see a very similar flavour to this had me very excited with hope it would taste just as good, however it wasn&apos;t, it was better! The popcorn comes in a neat cardboard tube which is a blueish green in colour, it has a foil lid on the top beneath the resealable plastic cap which is great as it means your popcorn will always stay fresh when you receive it. With the tube being only 90 grams in size I was worried it wasn&apos;t really going to contain much popcorn however I was impressed that it actually contained a decent amount. I was actually expecting Eureka to be a NZ made company so I was very surprised to see that it is infact manufactured in Malaysia and distributed by a company in Christchurch. When I first opened up the packaging and looked inside I was surprised to see that the popcorn wasn&apos;t coated in a sour cream and onion flavoured powder as this is what I expected to see, instead it looked like it was coated in a caramel like sauce, I actually had to double check that I had opened up the right flavour, sure enough I had. Miss 4 was patiently waiting to sample some of this popcorn so I gave her a small handful and also had some myself. I was at first intrigued by the taste it wasn&apos;t quite what I had expected and it did take a while for my taste buds to adjust to it, the popcorn appeared to be quite sweet, it was almost as though it had been dunked into a type of sweet sauce and then dunked again in a sour cream and onion sauce? Nonetheless I soon got used to this savoury/sweet combo and it was delicious and very moreish I could have easily eaten it all in one go, however I showed great self-control. I decided to put this popcorn through a couple of tests and added it to a chicken salad I was making one night, the popcorn added a beautiful crunch and texture and the flavour of the sour cream and onion was a great addition to the salad vegetables, my partner even enjoyed it even though prior to trying it he thought I was weird! With the last remaining popcorn the following night I decided to blitz it up into small crumbs in the food processor and use it to coat some chicken tenderloins again this made the chicken incredible, sour cream and onion chicken is actually a great combination, and Miss 4 couldn&apos;t get enough of it, she said it was her best dinner ever. If you are a popcorn fan who likes the flavour of sour cream and chives/onion this is a must try product, not only does it taste amazing, but it is also made from a special type of popcorn called mushroom popcorn which makes it so light and fluffy almost like you&apos;re eating little clouds of goodness, the best thing about this is that it really doesn&apos;t have any annoying little husks which get stuck between your teeth which is always a bonus. I have never heard of &apos;mushroom&apos; popcorn before, but what a fantastic invention that is lol almost spherical balls of popcorn meaning less wastage, no husks stuck in teeth like butterfly popcorn. Eureka popcorn is the handy little mushroom popcorn in a can, and possibly now one of my most favorite popcorn brands around. 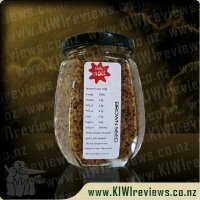 We were introduced to Eureka popcorn via KIWIreviews, and sent 3 different flavours to try. One of these was Sour cream and onion. Wanting to do something a little bit different with these, I decided to make a cheeseball and rather than coating in walnuts I would coat in the popcorn. I wasnt sure how well it would work, but am happy to say it worked perfectly. 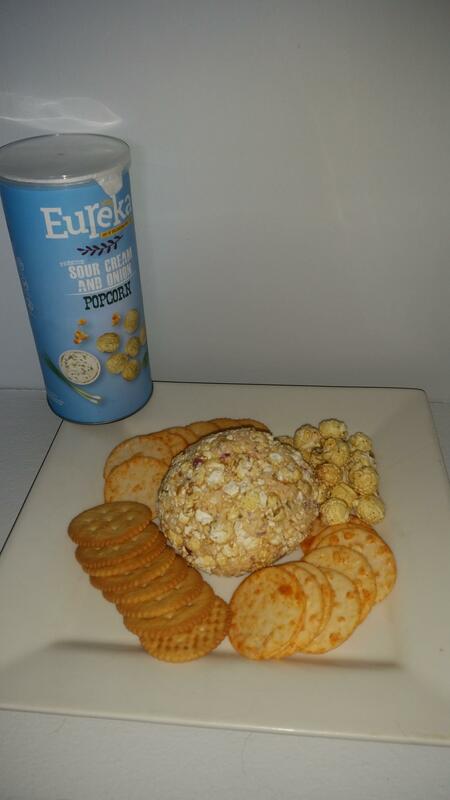 The popcorn added the perfect crunch and additional flavour to the cheeseball and it was perfect with the crackers. My 10yo daughter requested I make a smaller popcorn cheeseball for her to take to school with carrot sticks, which proved that this was a winner. I admit that the price for the size of the tub is high. But considering it is only 70g it is amazing how much popcorn they managed to fit into the tub lol We are a family of 5, and with making the cheeseballs and then trying the popcorn straight from the tub we got a fair share each. Price wise I would only purchase specifically as a treat or if I needed to make another cheeseball for a party lol which may cause some upset with my kids because they really do love them that much! So we saw the Eureka popcorn at the 4 Square around the corner when we went this morning and bought a container of the Sour Cream and Onion to try. It cost $4.60 for a 70 gram container which is very expensive for a snack with only one serving. We were pleasantly surprised with the shape, round puffs of popcorn with hardly any husk. They were very light and crunchy and had exactly the right amount of flavour. A sweet and salty mixture that was very delicious. 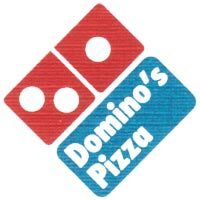 My 5 children all tried it and absolutely loved it, was such a pity there wasn&apos;t more as they could have probably eaten more than a packet each. My 1.5 year old was especially impressed, you can see his picture below. It was an awesome snack for him as with normal popcorn I end up with a handful of husks when he is finished but with this popcorn he ate the entire pieces and swallowed the small amount of husk. This would be great for anyone wanting a decadent snack for one without the sugar or fat content of some other snacks. It would be nice if it was in a bigger packet and at a smaller price but my kids said they will save up to buy it again so went down very well with them. Of all the popcorns in this range, this one was the favourite. For all of us (three friends plus me) it had exactly the right balance of salt and flavour, with just a hint of sweetness from the onions. It is rare that I ask a group to test a product and then find that they all have identical reactions, but this time round it was really true! They liked everything about it. 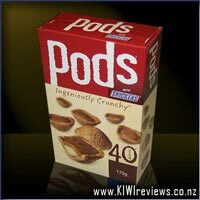 The only negative was the high price (and even then they conceded that it was fair enough since this was something you would have as a treat rather than as an everyday item) and the size of the package as they would have all liked a bigger helping. However, the package information states clearly that it is a single serve packet, so on balance that is acceptable too - we all got a decent sized handful. Apart from that, all of us were very happy with the product. We had all been sceptical at first about how well the flavours would work with popcorn. After all, this is a flavour normally used with potato chips, but none of us would ever have thought of combining it with corn. It just did not seem right. So our first taste was cautious in case it tasted funny! Nothing could be further from the truth. The flavour blasted us with a fabulous mixture of slightly sweet and slightly sour, surprising us all by just how good it was. The crunch aspect was pretty good too. Not as crisp as a potato chip, but not too soft either - just at that perfect space in between the two extremes. We all said we would buy this in preference to an equivalently flavoured potato chip any day. There was just no contest! One person said she thought the flakes would be quite nice with a dip, but the rest of us did not agree with her: we thought they were quite fine just on their own without any additives at all. If I were hosting a party, this would be my snack of preference. It is tidy on a plate or in a bowl, it does not get stuck between your teeth in the same way that conventional popcorn does, it tastes really good, and if you drop it you don&apos;t end up with a floor covered in greasy crumbs. In short, it is the ideal accompaniment to drinks. It does not even need dips or plates of cheese to accompany it. I&apos;m going to buy this again, and so are my three friends. Popcorn is a "sweet" - everyone knows that. But it didn&apos;t used to be, or course. Originally, Popcorn wasn&apos;t drenched in icing sugar, or dipped in chocolate, or sprinkled with various sweet flavourings. It was popped in oil or butter, and eaten with salt. So I had to laugh when I told a friend about this flavour and their first reaction was "Ewwww! That&apos;s just WRONG!" Even after I explained that it&apos;s no different to similarly-flavoured chips - potato, rice or corn - because it&apos;s all starchy carbs when you look deep enough, they were dubious and refused to try a taste. Their loss, all the more for me! Because I have to say, this was my all-time favourite of the four flavours. The softness of the popcorn meant my sensitive teeth didn&apos;t act up anywhere near as bad as they would have with chips, and this is certainly a flavour combo I have always enjoyed. Can&apos;t tell you why - normally I hate sour cream - but this is a flavour I adore... and this popcorn really nails it perfectly for me. It&apos;s got a bit of a sharper flavour profile than any similar chips I have come across, so some people may find it less appealing though. Portion-wise - I had to knock it down a point because I am sorry to say, the 70g just wasn&apos;t enough. I could easily have made this my meals for the whole day. I would love to see this in a 150g bag, but the price feels a little steep for popcorn. Not as bad as you would find at the cinemas, of course - they are insanely pricey - but this is a treat, and an imported one at that, so the price isn&apos;t too unreasonable when you think about it. Overall, this is a bit of a black horse snack - you think it&apos;s going to be rubbish, but for me it turned out to be the winner by a mile!